A new baseball that is used in big league competition is made of a smooth, painted white leather. It is stitched with protruding threads, which when thrown by a pitcher toward the strike zone, spin and whip against the air. The air then pushes the ball in the direction of the spin. A fastball is thrown with two fingers which snap off the back side and bottom of the ball to rotate the ball backward against the air, helping to lift the ball--even if the lift is only enough to change the downward direction to one more level with the ground. Baseball hitters have observed a "hopping fastball." Physicists should not dismiss this as readily as some do. Along the path a fastball takes, turbulence builds up on the front of the ball caused by molecule displacement. As the air attempts to equalize, pressure builds and pushes the ball off course. This phenomenon is akin to the reason that airplane wings slant backward to afford a "wiping" effect of air molecules off the leading edges, and the reason rockets are built with cone-shaped noses. A knuckleball moves two or more different directions (sometimes upward) in a "hopping" fashion from the same cause, i.e. air pressure buildup. View this series on our Videos Page. The amount of movement on a pitched baseball is directly correlated to the weight of the air through which the ball is flying. The amount of movement a pitcher can get on his pitches is directly correlated to the pitcher's success. In very light air (higher altitudes and hotter temperatures) the pitcher will have more difficulty getting his "stuff" to work effectively. Conversely, the hitter will be challenged the most when the pitcher has his best "stuff". 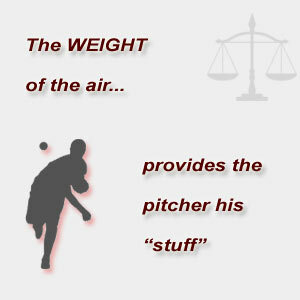 The air weight is what provides the pitcher his "stuff". More ball movement generally is considered more effective in competition against a batter.